We got on board and the bus was nearly full, so initially we had separate seats, but it was a comfy air-con coach, so not all bad. 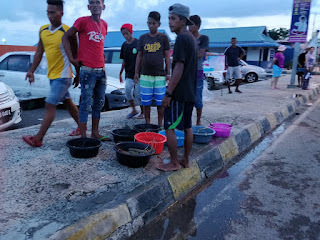 I paid the 45 MYR each for the 3 hour journey, and after a few more locals and tourists got on, off we went down towards Semporna. We had one quick toilet stop and a few hours later we arrived, and with a 5 min walk to find our hostel (after having to message them to ask), we got checked in and shown our room. With only staying here a couple of nights, we booked cheap so we had a shared bathroom. We also had no window and the bed was pretty much on the floor. But what was more surprising was that the place was full of workmen and it was clearly going through a refurbishment, as certain bits were all new. However, there was walls half built, we had to step over someone welding to go into the ‘Living Room’ which was nice. But the people who ran the place were lovely, so we just put up with it for the 2 nights. Once we got settled, we headed out for food. Semporna isn’t a very glamourous town; our plan here was to go on a day trip out the following day to one of the beautiful islands so we could go snorkelling. We found a KFC which was just what we needed and then went for a walk around town. We tried to get down to near the waterfront by following Google maps, however the route was blocked by a huge construction site. There was a little side alley full of tables set up with random stuff being sold, a lively little place which was very run-down and uneven ground, but fun to look at. We then found a rooftop bar later (one of very few in this town) which was on a hotel near the port called Seafest. We had a couple of beers here and then went back to the hotel to do some admin and get refreshed before dinner. The main part of town is quite untidy and run-down during the day, but when we walked about in the evening, it came to life. 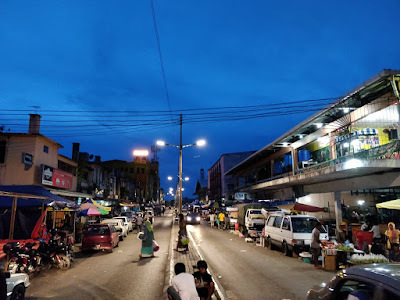 Obviously, it’s Ramadan just now, so that would explain the more active evenings, with little market stalls and food vendors all setting up for the evening. 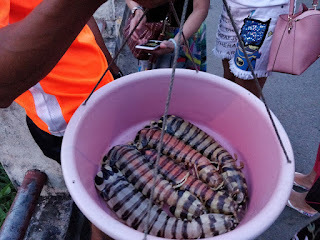 We took a walk round the port, where the young locals all had their own buckets and pots with what must have been todays catch, so we assumed the all bought some, to try sell on for a few ringgits more… and it seemed to work as they were mobbed by the hundreds of Chinese tourists in the area. Looking for somewhere to eat, we walked along the waterfront which consisted of half dozen seafood restaurants, none of which took our fancy. Well that plus the awful band/karaoke that was coming from one of the establishments there which could be heard all around the bay. We wandered back over towards the Seafest bar, as we noticed an Indian place below it which looked good, so we went there for some roti and fried chicken before heading back to our hotel. The next day as I mentioned we did plan to go on a trip, but we wanted a long lie for a change, so we cancelled that and instead took up residence in the living room after breakfast and stayed there for pretty much the whole day. 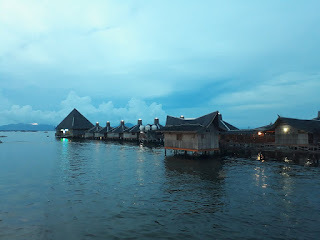 I spent most of the time sorting out photos, blogs and researching Indonesia as we had just booked our flight to Jakarta, and unlike the rest of this trip so far, we are now not planning much in advance at all and seem to be winging it! Sadie spent most of the day watching one of the little English channels that was on the TV, which happened to be a gamers channel and a Dota2 live tournament was being broadcast the full day, so that kept her occupied as I did the admin. We got out the hostel early evening to head for food, and just as we were crossing the road outside, a car slowed down and rolled the window down. And it was Neil, an Australian photographer/tourist who we had met for 1 night up at Kinabatangan, but left early as he didn’t manage to get many good shots. When he checked out he must have left his laptop bag in his room which was next to ours, so housekeeping had left it outside the room. I had picked it up and took it with us to Semporna as had mentioned he was going there, so on the off chance we seen him, we could reunite it with him. We went back to the hostel to collect it for him, then he drove us back down to the Seafest hotel as he was staying near there. Deciding to go for a few beers, he joined us and we sat and chatted for a while about travelling and we got some nice food there too, before we headed back to the hostel to bed. 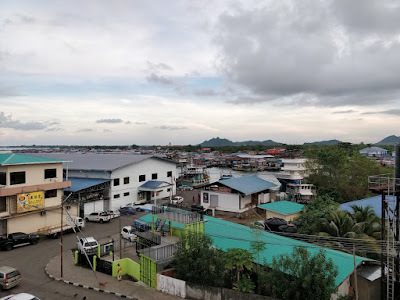 The next morning, we had to get to Tawau which was around 2 hours south-west of Semporna, we asked the very helpful hostel staff, who took us round to where the bus leaves from. There were also some cars there, and after a brief conversation between one male and the receptionist, we agreed to pay 20 MYR each for him to take us. I guess this was an unofficial taxi service that locals do to help pay their fuel bill if travelling around, as before we hit the main road, we had to go get fuel and he needed my cash to pay for it. But it got us there quicker than the bus would have, plus he could drop us off right at our hotel, which was ideal. There was another couple of females in the car, plus a kid but it was a long, boring journey as no one spoke at all. He dropped us off right outside our hotel, which was in the middle of town. It was quite a nice hotel; however, the included breakfast was served at a food outlet across the road. We chilled out in the late afternoon, having Fox Movies in English too on the TV was good as we just watched a few films. That evening we went out for a walk round, it was quite a nice town with market stalls and we went for a beer before heading to a place called Secret Recipe for dinner, which was lovely. After a disappointing breakfast, the main reason we had come to Tawau was to get our Indonesian visa sorted. When you enter normally, we can get a 30-day visa on arrival which is free but can’t be extended. You can also pay for a standard 30-day tourist visa, which can be extended once to 60-days, but from what I have read online trying to get that sorted when in the country is a nightmare and involves several trips to an immigration office. But I had read that there was several Indonesian Consulates (of which there is one here in Tawau), that will issue a 60-day Social, Tourist & Cultural visa if you attend. So, we get a taxi to the place which is on the outskirts of town in the middle of nowhere, and arrive at 09:00 just as it opened apparently. However, the place is already busy with locals/Indonesians. There was seats and tables outside, a reception desk outside and inside it was full of rows of seats and about 10 windows all for different things going by the writing. 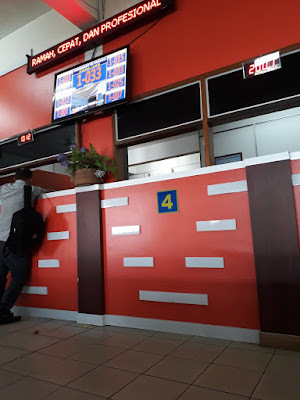 We asked the guy on the reception desk, explained to him what we needed and he then gave us a ticket with a number on it, so you would take a seat and wait to be called. We were ticket number 2001 and all the others were mostly starting 1000+, so it wasn’t long before we get called to a window. The man clearly knew what we wanted, as he handed us some forms to complete and a letter template to copy and explained what we needed. 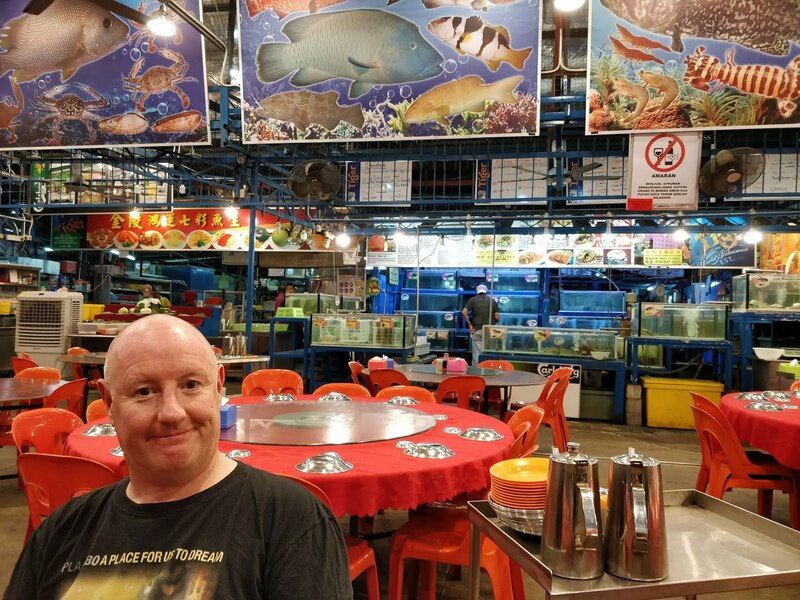 Luckily, we are quite organised and already had copies of our passports, photos and the money to pay for it (although the US dollars we had were no good here, so had to go to an ATM for more ringgit). But what we didn’t have was details of an outbound flight for when we leave Indonesia, I had read that some of them ask for it and some don’t, so we took our paperwork outside as Sadie started to fill it out, whilst I got on my phone searching for flights for a random date and destination in approx. 8 weeks’ time. 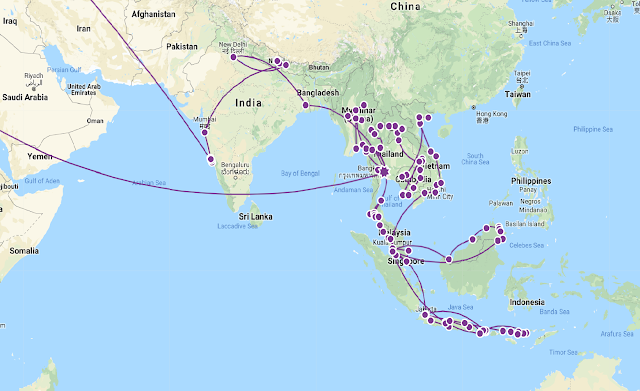 As we hadn’t even decided what country we were going to, it was all a bit rushed but I found a cheap flight for less than £100 to Ho Chi Minh City in Vietnam, so we just booked that one! Taking our forms back in, he checked over them and told us it would be a little wait, so we decided to go out for the cash to pay for them and grab a coffee. On returning to the office an hour or so later, we get called back up and get a receipt and sent to another window to pay the 205 MYR each, then we had to take that receipt back to the first guy to check and then told us to sit down again. We thought it wouldn’t be long now, as it had been about 4 hours since we arrived, and had read some people had been in and out in 3 hours. But no, we sat for another 2 hours before being called up again, where we got issued a nice shiny insert into our passport, and off we went back to the hotel pleased that we are now good to enter Indonesia tomorrow for 60 days.